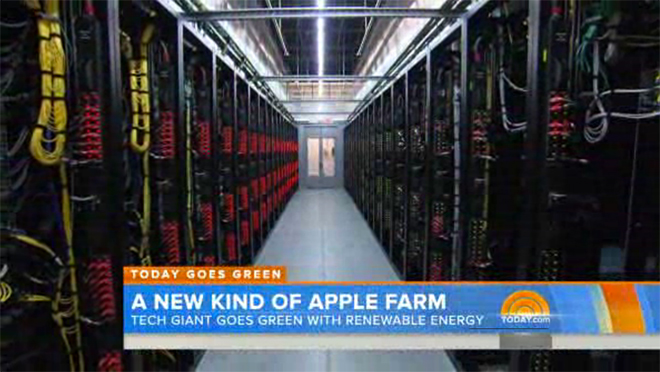 In a brief news package for Today, NBC chief environmental correspondent Anne Thompson gave a rundown of Apple's green initiatives, including the company's huge solar panel installation at its iCloud data center. "All the cool convenience of your smartphones and tablets come with a hidden price —power," Thomson said on location in Maiden. "But downloading apps and information in the cloud no longer means polluting the air." Strolling through the huge solar panel farm, the reporter interviewed Apple Vice President of Environmental Initiatives Lisa Jackson. The former EPA administrator explained that with clean energy, like the nation's largest end user-owned solar farm, Apple is able to support a growing number of connected devices while at the same time shrinking its carbon footprint. "We think this is an opportunity for us and for our sector to leave it better than we find it, to actually help people convert to cleaner energy without even knowing they're doing it," Jackson said, echoing statements made earlier this week by Apple CEO Tim Cook. The interview offered a rare peek inside inside Apple's Maiden data center, which houses servers and telecommunications equipment responsible for iCloud, Siri and other online assets. Jackson said a good chunk of the energy created by the on-site solar farm and biogas generators go toward cooling the machines. Thomson noted that while other tech companies like Google, Facebook and Yahoo use clean energy at their respective data centers, only Apple's is using 100 percent renewable power. Apple has been on an eco-friendly tear this week, publicizing its environmental initiatives with the launch of the "Better" campaign. Along with a revamped environmental responsibility webpage, the company announced a new recycling initiative and touted advancements in its clean energy programs.